The Great Luxury Fragrances & Cosmetics Sale at BGC is back! Check it out on March 15-17, 2017 at Net Cube Bldg, BGC. 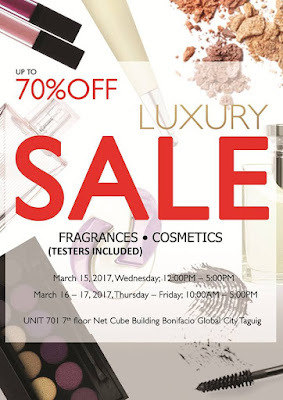 Come and get your lippie on with up to 70% off on luxury fragrances and cosmetics; testers for fragrances are also included! Just a reminder to refrain from wearing shorts and slippers. The best notes are vanilla orchid, magnolia,suave petals neroli and peach. The mid notes for this scent are honeysuckle, almond and musky cream. The most ideal approach Lucy Liu Skin Care to discover your perfume is you should test the perfume on yourself not your companion in light of the fact that a similar perfume will be diverse on two individuals.